If you like crime scene investigation, or reverse engineering or just analyzing things, here’s a nice challenge for you. 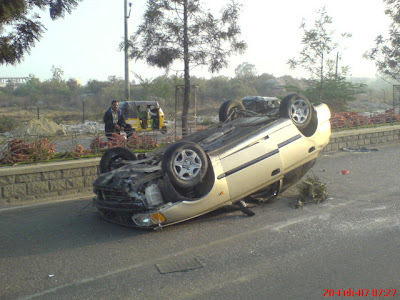 About a week ago, during my morning walk, I found a car (Hyundai Accent) turned upside down on a two lane road between Madhapur and Kondapur, in Hyderabad India. The road divider (median) is intact. Meaning, the vehicle has not hit the median. Thus, this is a case of speed, negligent and most probably drunken driving and the accident has happened without involving any other vehicle on the road. 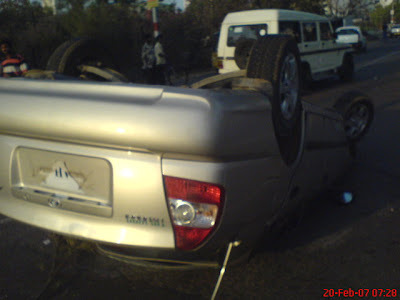 Now, coming to the question, can you predict the trajectory this vehicle would have taken before overturning itself? What might have triggered this? Did the vehicle tipped over a stone while cruising at top speed? (My flat mate Prasad feels this one is the most probable reason). In the second pic you can see some grass. I'm not sure if the car dragged it along or it came there by other means (people placing it there or by wind etc). There're no trees (of that particular type of leaf) with branches hanging so low for a car to grab it. The car has not dragged further after turning over and hence the passengers were saved (seatbelt should have done its job, no blood was found at the site). Had the vehicle dragged further, it would have squeezed passengers to death. What made this car to spin exactly 180 degrees on its horizontal axis (clockwise)? I've seen something like this myself on a few highways. Always wondered how they managed it. In fact, I once saw a car caught right between a stone median bang in the middle of the city. Wonder how drivers accomplish such feats. If you've seen any Bond movies(Even the latest, Casino Royale) you get to see such incidents where the make the car upside down! This might be one such incident! its kind of scary also.but i think the driver is very careless! I dont think any of the Hyundai accent models has AIRBAGS.. Still the passengers are not injured..sounds great! really very lucky! 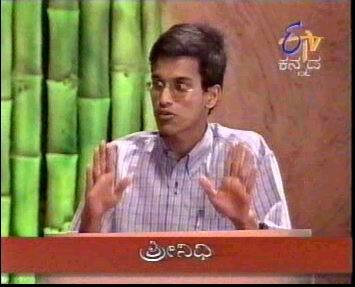 Nice work shrinidhi! Interesting post and Pic's! This assumption is based on thinking that it rotated anti-clockwise, not clockwise as you said, in its horizontal axis, and rotating 360 degrees on its vertical axis clockwise, that caused the car not to drag forward much on its roof. If it actually had rotated in clockwise direction in its horizontal axis, and turned only a bit (if it's not 360, it has turned in anti-clockwise) in its vertical axis, the following theory is completely wrong. Its rear right wheel hit a stone or the divider, and the driver impulsively steared to the left, and then to the right seeing the car going to move diagonally across the road - making it move back to right in a curve. Hitting the stone/divider must have caused the car's right side to lift a bit too, and when it's added with the centripetal push, it got toppled. It fell right on the roof, the hood hit on the road and lifted up, not leaving a mark on the road when it turned in its vertical axis. The car doesn't seem to have been in the air, and must have almost rolled upside down, and that could be the reason that its roof is not completely collapsed in. I also think the drivers seat had fell backwards to save his/her life. The point the vehicle hit the stone/divider will be 100-150 mtrs before the spot it's now. And the car would have been 160+ kmph when hit.
) driver hit the road divider (3) on its right rear wheel (4) and the car flipped over sideways (4) to fall the way it has in this case. 1. The accident occurred at night. The pics seem to be taken in the early morning (my guess, nidhi will have to confirm). Because the shadows are more horizontal so its either early morning or late evening, but I will rule out evening because there is usually more traffic at that time. 2. There has been no collision with any other vehicle. This kind of accident would have made a big dent on the car which is not present. (as observed by you). So the probability of the driver being drunk becomes very high as that is the most common cause of accidents. 3. If we look carefully at the leaves under the car the only place they are present are on the trees on the divider. (look at the pics.) So the car definitely hit the divider. The leaves could not have come from the trees on the other side of the road as that would be too far. The leaves/branches got stuck on the roof when the car was flipping. 4. It is visible in the photos that there is a dent on the right rear wheel, so that is probably where the car hit the divider. 5. 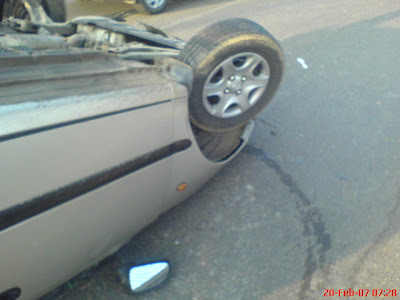 When the rear tyre of the car hit the divider, the car tended to fall towards the divider but the driver made desperate measures to balance the car by turning the wheels towards the left. 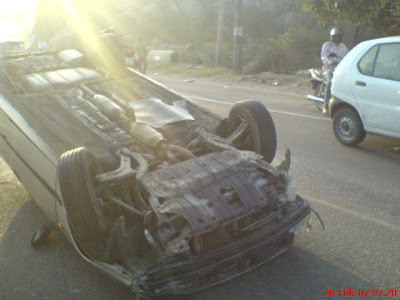 However, this led to again loss of balance and the car tripped horizontally 180' clockwise to fall upside-down on the road. I would also like to add a paint image of the events of the accident but we cant add attachments to the comments. However being a nonengineer I think I can better explain point 5 by drawing rather than action of forces. This was posted an year ago but hope this makes sense because this would contradict the assertion by Jubin George. If you wish to send a drawing depicting the solution please send it to admin at enidhi dot net... I will include it in the post with due credits to you. 1. You can see the timing in the photo... Also as stated in the post the pics were taken during morning walk. Accident has happened during the night. 3. Most probably right.. I should have taken photo of the divider to assess damage to it, if any... My mistake..
5. I appreciate your visualization- but what do you think made the car jump high in the air that rear wheel went high enough to hit the road divider? 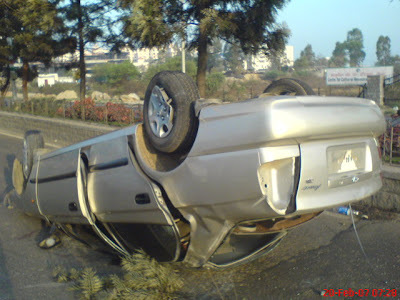 Something should have abruptly tossed the car above ground.. Any guess? As the accident took place late at night thus the car showed no signs of damage from front or rear..
as for my guess the car should be well above 100 kmph and there should have been fine gravel or sand on the road (as in my case). the person tried to turn the car or tried to move the car very abruptly or was tryin to avoid someone else on the road..
thus could not control the car at that high speed! Car should have fallen from loaded truck which use to carry cars.